Robert Silverberg is an author hard to criticise. He is a master of his craft, a stylish and sophisticated constructor of stories, an intelligent observer of the foibles and strengths of our species. Indeed, the harshest criticism is one of comparison: that his work today is not as good as it was, that the peaks are not quite so high and the sweep of imagination not so bold and daunting as they once were. And if such a criticism seems unfair, it's all his own fault for writing such classics as the novel Dying Inside and the collection Capricorn Games. 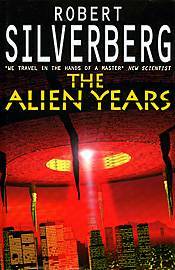 Silverberg's latest novel, The Alien Years, tackles one of the oldest questions of the genre: what do we do when the aliens land in our midst? Seven years from now, alien ships land in major cities around the world. And what message do the aliens -­ or Entities, as people come to call them -­ have for humankind? The simple answer is none at all. The aliens -­ quite naturally for a culture capable of travelling between the stars -­ are so much farther advanced than us that they treat us as little more than mosquitoes, or ants: for the most part we can simply be ignored, but if we get too pesky we can easily be squashed. Perhaps the seed for this novel is revealed early on, where Colonel Anson Carmichael thinks back to reading HG Wells' The War of the Worlds. The book had annoyed him, "...because it asked an interesting question -­ What do you do when you find yourself up against an utterly unbeatable enemy? -­ and then had supplied no useful answer..." -­ Wells' story being resolved "...by the merest of fortuitous flukes..." This reference informs the rest of The Alien Years, and not necessarily in the most obvious of ways. The novel is fragmented and episodic, jumping at several-year intervals over a period of around half a century, dipping into characters' lives and then passing hurriedly on. The opening sequence formed a particularly memorable story published several years ago in Omni. The misanthropic Mike Carmichael flies his Cessna back to LA after a week of "solitude and inner retuning" in New Mexico, to learn that he's about the only person in the world not to know that the aliens have landed. Mike is the kind of bitter character, torn between New Age leanings and his loyal and responsible upbringing in the military Carmichael family who could easily form the focus of the novel. But anyone who's read the jacket blurb knows that Mike Carmichael is little more than cannon fodder, destined to become part of the first wave of humans to die as a consequence of the alien landing. Pretty soon, things start to deteriorate and the Carmichael clan are faced with the dual problems of finding some way for humankind to fight back, and of simply surviving the chaos caused by the Entities' activities. By concentrating on the problems facing this one family for most of the novel, Silverberg etches in the backdrop of global conflict with admirable, and thoroughly convincing, economy. The effect is claustrophobic and compelling. Strangely, one of the main weaknesses of the book is in its character development: far too much of this takes place off-stage. In the early years, for example, a lot is made of Mike's rogue brother Ronny: a con-man, a rebel, someone never to be trusted or relied on. But once the crisis hits, Ronnie comes over all responsible. For a long time you're waiting for something to come of the build-up, a pay off for all the early references to his rogue nature, but it never happens: Ronnie has changed, and we never really saw it happening. An even more extreme example is Richie: initially he's portrayed as a sensitive young man in a brutal world, yet when he reappears on the scene he is suddenly a violent thug. There's no attempt to explain this, no justification for the massive personality change. It's easy enough to speculate about why he might have been transformed, but it seems an oversight for such changes to take place beyond the pages of the book. Yet despite such criticisms, The Alien Years is still a fine novel, a smooth and captivating read -­ one of the all-time greats, just doing his thing. With this novel Silverberg asks old questions and toys with our expectations of how they should be answered. And the joke is that with aliens so superior as to be virtually god-like, you certainly can't expect them to conform to genre cliché, or even to the basic expectations of plot. It's reassuring to see Silverberg on such good form. Edge of Light brings together five Silverberg novels from the period when the author was at the peak of his powers: A Time of Changes ( first published 1971), Downward to Earth (1970), The Second Trip (1972), Dying Inside (1972) and Nightwings (1969). I shouldn't really have to say any more than that: just go and buy it. But I will say more, just a little. Dying Inside tells the story of David Selig, a telepath who has to come to terms with the fact that his powers are fading as he enters middle age. It's a simple story: the relentless extrapolation of a single idea, a fairly standard sf whatif taken step-by-step to its logical conclusion. A simple story, perhaps. But also one of the truly great novels of the twentieth century. So yes, Edge of Light gets the thumbs up. nonfiction - more of Robert Silverberg's books reviewed.